Le Creuset makes a variety of vessels for soup. The Stainless Steel collection includes several sizes of soup pots perfect for large portion cooks. 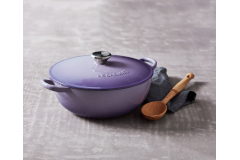 The traditional Enameled Cast Iron Soup and Bouillabaisse Pots are available in sizes ranging from 1.5 quart to 7.5 quart and feature the superior heat retention that Le Creuset is known for.